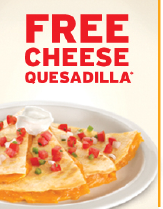 From now until November 7th, you can print out this coupon to receive a FREE Cheese Quesadilla from Denny's. YUMMM!!! I am really craving Mexican food and this sounds pretty amazing. Enjoy!! !